This section is dedicated to Family and Children. 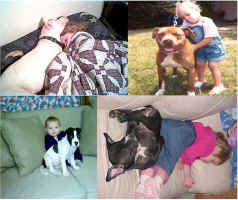 We hope that all who feel like the PitBull is an untrustworthy child eater will see these pictures and realize that they are not. 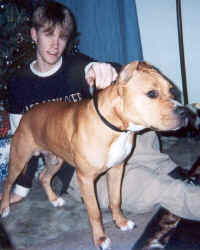 If you would like your Family PitBull pictures displayed through our site we can make this possible once you become a member. If you would like to become a member and register your American PitBull Terrier ( APBT ) puppy with us you may visit our How to register and get papers on my PitBull for more details. "Fear is the first response to an irrational decision."